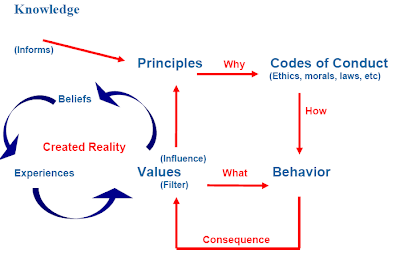 Minessence Values Framework [MVF] Knowledge-Base: I am wondering why people would find some of their chosen values draining? I am wondering why people would find some of their chosen values draining? Energy Giving—Typically, these are the values which energise you. They put you in a “flow state”. Values, such as Intimacy, Sharing/Listening/Trust and Skilful Leisure, are in the energy giving category. Energy Draining—Typically, these are the values which drain your energy. Values such as Care/Nurture, Endurance/Patience and Duty, when they are your main focus, are likely to drain your energy as they can keep you from paying sufficient attention to your energy giving values. Energy Neutral —Typically, these are values which have little impact on your energy levels. In most situations, living these values requires little mental attention/energy to remain focused on ‘the task in hand’. Values such as Work, Organized Play, and Communication/Information fall into this category. Once a person's value priorities are known, a graph can be produced, see below, which identifies the relative percentage of mental energy the person is devoting to these three value categories. If the graph shows that the person scored significantly higher on energy draining values than energy giving values, this likely indicates a stressful lifestyle. In which case, the person may want to review the way they are currently approaching life so as to spend more time engaged in activities that will give their energy levels a boost. One very effective way of living a more energising lifestyle, is to spend at least two hours per week engaging in creative mode activities. What's the Link Between Values & Skills? Why Value Descriptors in lieu of Definitions?